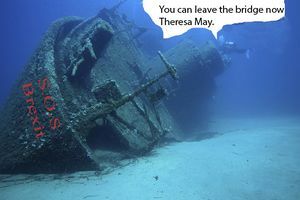 London, United Kingdom -- British Prime Minister Theresa May has vowed to keep going with her SOS Brexit deal, despite the ship recently sinking in 300 metres of murky water. The recently re-floated SOS Brexit sank when it was hit by a multitude of torpedoes, mines and the actions of the crew who left open the port holes. Everyone abandoned ship except Theresa May went down with it to the bottom of the sea. Just as well she had taken an aqua lung with her. "I am not giving up," she said in between blowing off a lot of bubbles. "This is my ship and I remain the captain of Brexit. Most of my crew are still here. I locked them in the hold." SOS Brexit has had navigation problems since it left the Port of Unicorns back in June 2016. The original captain David Cameron was made to walk the plank in July 2016 whilst his expected successor Boris Bluebeard was found stabbed in the galley by cabin boy Michael Gove, Theresa May was promoted from her position as ship's passenger checker to captain. "The chances of SOS Brexit getting refloated actually depends on the same people that sank it," said British political commentator Gordon Ramsay. "Chief amongst them is the Super Liner EU and its Captain Jean-Claude Juncker. He has offered to drop a tow rope for May to catch." Theresa May is so far staying on board, confident her ship will be refloated again with more promises.